Last remaining 4 bed show - townhouse is now for sale, this property will qualify for the Help to Buy scheme as the sale is to include all contents. Located at the top end of the development, overlooking the Canal, this property is ready to go with completion within 6-8 weeks. For further information or to arrange a viewing please contact Nick Moore for further information on 01-6671888. All our other 3 & 4 bed homes are now sale agreed and we are only taking names for cancellations. 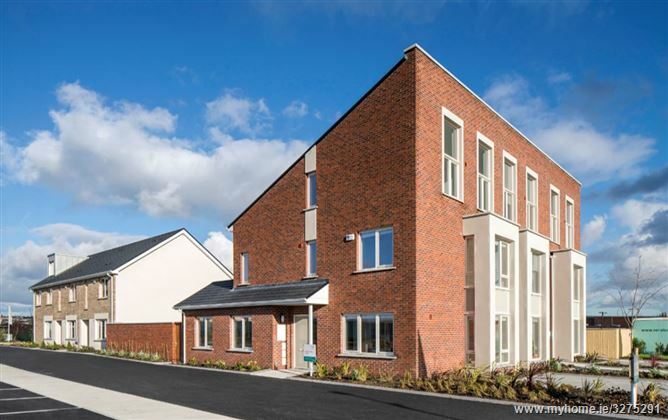 These elegant 4-bedroom homes are extremely modern and very spacious as designed by O’Mahony Pike Architects and are presented in a very attractive landscaped environment. All of the houses are A-rated and the levels of energy efficiency far exceed the average home. An array of features combine to ensure lower energy usage and higher levels of comfort – including exceptionally high levels of insulation incorporated in the walls, floors and ceilings. The houses also feature an Air to Water heat system, an extremely efficient heating system that serves wall mounted radiators and provides domestic hot water. Ballyboggan Road. RCP is at the end of Ballyboggan Road. Travelling from the M50 take exit at junction 6 heading for N3 N City Centre/ Castleknock. Proceed straight ahead onto Navan Road, for 1.5 miles and turn left at the roundabout at the Halfway House Pub. Cross over the railway line at Ashtown Station at after the SuperValue store, turn right at the small roundabout into Rathborne. Proceed through the Rathborne development until you reach the show houses at Royal Canal Park.